This time of year, it is not unusual to find an abundance of watercress in and around the woods. Watercress is available in many places where there are streams of shallow moving waters. Watercress (Nasturtium officianale) is an aquatic leafy green vegetable that tastes peppery, like a Nasturtium leaf or flower. It is stupendously good for you and this time of year, when we have only been seeing kale and more kale, it is a welcomed addition to our daily greens. It seems just what are bodies are calling for, nutrient wise. Watercress is the latest in a long line of so called ‘superfoods’ that have been found to have beneficial and protective health properties. This green powerhouse contains 15 essential vitamins and minerals. It has more vitamin C than oranges, more calcium than milk, and even more iron than spinach. Watercress also contains beta-carotene (Vitamin A equivalents), iodine, copper, potassium and is a great source of antioxidants. As watercress is a cruciferous green, it is rich in anti-cancerous phytochemicals such as beta-carotene and flavonoids. It’s also high in iodine, which is supportive for those concerned about their thyroid or hyperthyroidism. The British Journal of Nutrition and Biochemical Pharmacology published two studies in 2010 that show possible insight into the potential anti-cancer effects of watercress. Watercress contains a compound, the same compound that gives it a peppery taste, that acts as a shield and helps prevent the cancer cells from stealing the oxygen and growing. 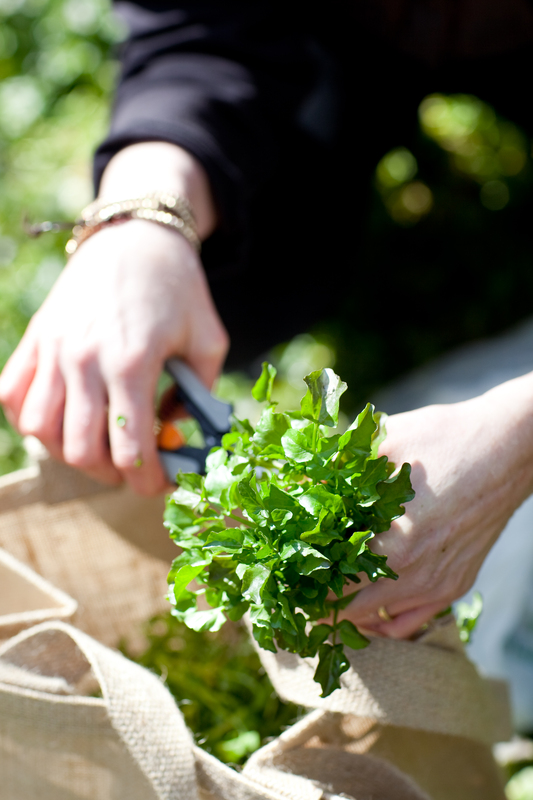 The micronutrients of watercress work with the antioxidants to combat cancer-friendly free radicals in the body. The raw leaves offer the highest nutrient value and watercress can be juiced with just about anything for a perfect green smoothie. For soups, place watercress in the stock after reaching a boiling point to avoid destroying the nutrients by overheating. When you go out foraging, bring a plastic bag and a scissors. Be sure to leave behind the roots and cut the top. 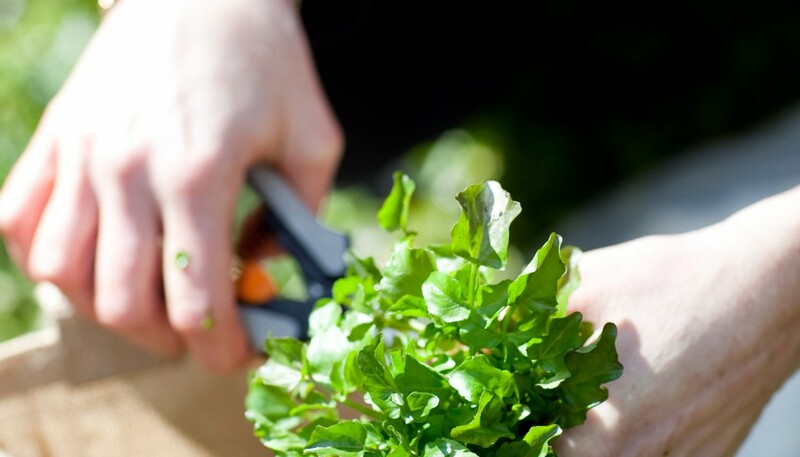 The watercress will also grow back more easily if you don’t pull out the roots, which tend to come out when you pick it by hand. We like to harvest from different areas, not just the same hedge, but all down the creek bed. This past week I grabbed a bag full of roots and watercress and took it to a stream near my house in hopes that I could transplant some closer to home. If you are not a forager, there is some beautiful red watercress in stores that comes from Fellsmere, Fl., reportedly the world’s largest watercress grower. 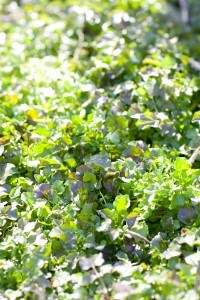 The wild red watercress was discovered in a semitropical wetland at the northern headwaters for the Florida Everglades. The grower reports that they grow their watercress sustainably. Watercress makes the perfect green smoothie – one sliced apple, 2 cups of watercress, 1 whole avocado and 1 cup of coconut milk and blend! This meets three of your 10 servings of vegetables for the day! Heat the oil in a pan and sauté the onions until translucent and slightly golden. Add the carrots, celery, cubes of potatoes and bay leaf and stir to coat and leave to cook for 10 minutes. Add the stock and stir well. Boil for 10 minutes, or until potatoes are cooked. Remove from heat. Add in the watercress, one cup at a time and stir in until just wilted, to preserve as much nutrition as possible. Pour into a blender – you may have to do it in batches. Meanwhile, sauté the onions until soft. Add the lentils and double the amount of water (1 to 2 ratio lentil to water or stock) and bring to a simmer. Cook slowly for about 30 minutes, until tender but not mushy. For the dressing, whisk all the ingredients together thoroughly with some salt and pepper. Drain the lentils mixture. While still hot, toss the lentils with the dressing. First, pile a on top of the watercress sprigs and finish with a few cheese shavings. Parmesan, hard goat’s cheese, or hard cheese, shaved on top of the salad makes a fine meal. You can add a piece of kombu (seaweed) to all my beans when cooking. The kelp has natural glutamates that enhance flavors, tenderizes the proteins and adds invaluable vitamins, minerals, and trace minerals. You also add cumin, epazote, fennel, ginger, or winter savory, which aids in bean digestion. BUT! Not all in the same dish, choose your flavor profile and add accordingly.